It is hard work trying to restore this garden. 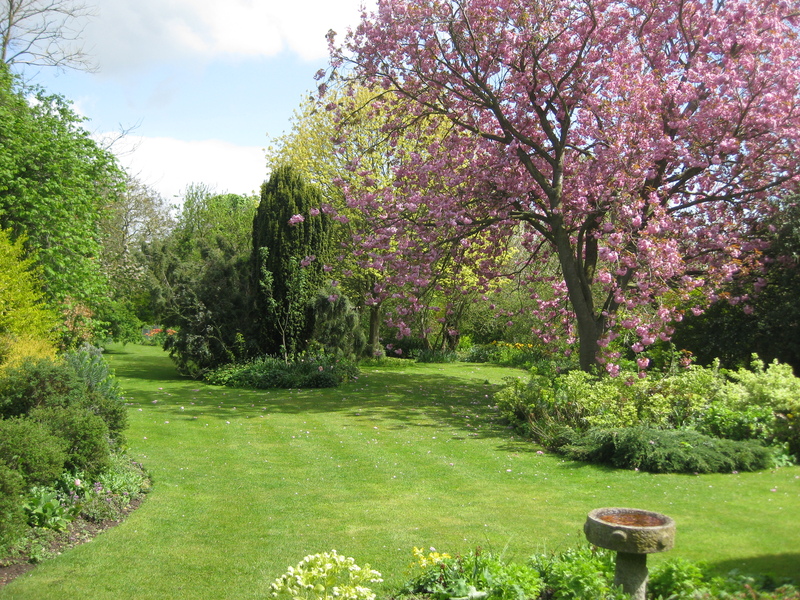 It has some lovely mature trees and shrubs but it was sadly overgrown when we arrived. The first things that had to go were all the fussy little island beds. The large bed round the cherry tree was infested with ground elder. I’m not sure whether I want to keep the cherry I don’t particularly like those big, blowsy flowers but my husband has voted for it to stay. I decided to make a pond here. it is finished now. 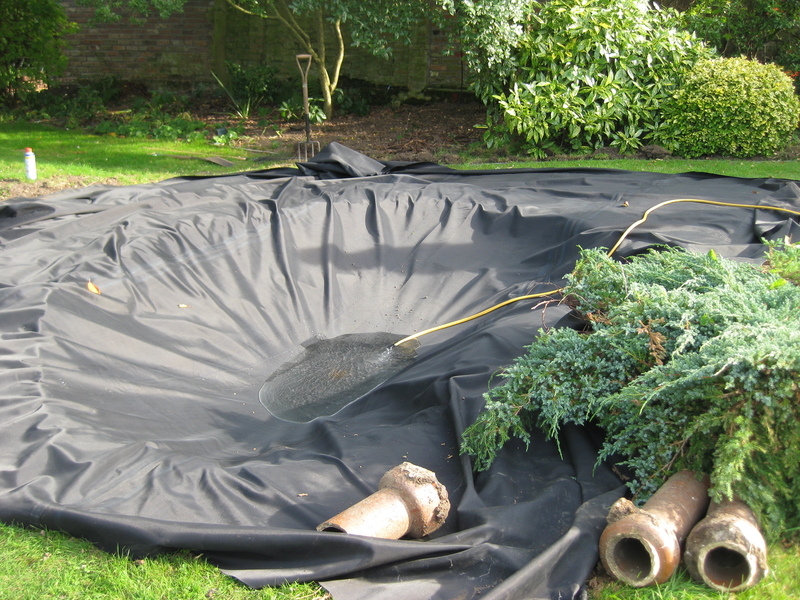 I would have preferred not to have a butyl lining because it always shows a bit round the top but I didn’t have the skills or the money to build a pond using any other method. I have made a bog garden at one end by sinking the butyl, making a few holes in it and filling it with good compost. The pots all round the edge are to keep out herons. it really works because herons like to be able to walk in to the pond and they can’t do that here. 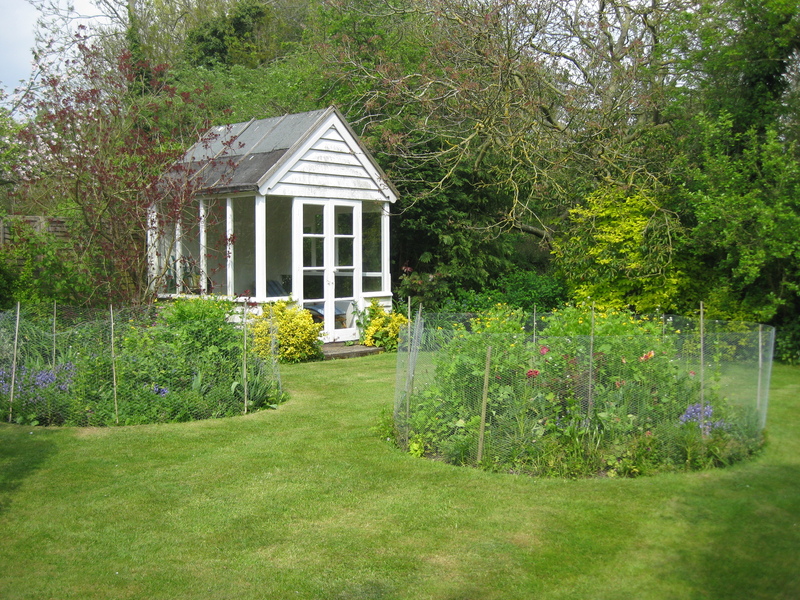 By the summer house there were two pointless little circular beds looking very eccentric because the flowers here were carefully caged in. It must have been a precaution against rabbit damage but this problem has been solved for now by carefully mending the broken bits of fence round the perimeter of the garden. Anyway the beds had to go. In their place we had a terrace built round the summer house where we can eat under the shade of the walnut tree. Round the terrace I planted Lavendula ‘Hidcote’. 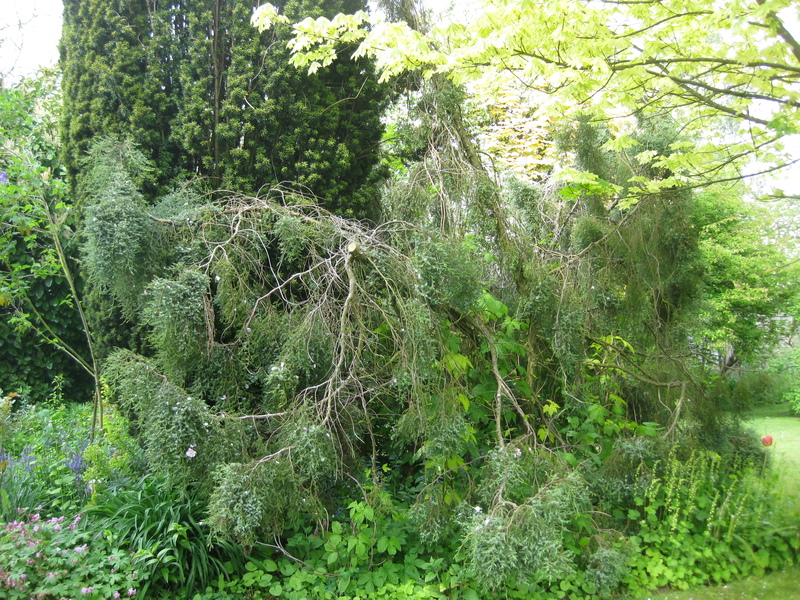 The biggest problem was getting rid of all the overgrown rubbish round the yew tree;Taxus baccata ‘Standishii’. In the end we had to get someone with a mini digger to get the roots out. The last two island beds to go were one round the bird bath and one right next to it. I left the bed under the weeping pear: Pyrus salicifolia ‘Pendula’. This has snowdrops under it and in summer I plant white Impatiens. The final picture shows the view without the island beds and there is ‘The Pianist’ using the garden for what he feels sane people should use it for- sitting. 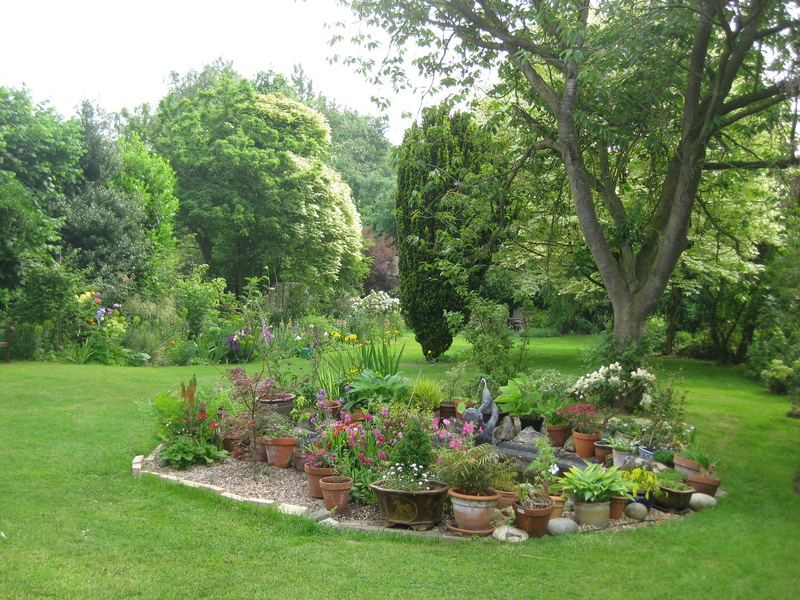 When we arrived here just over three years ago the garden was in sad need of some tender care. My first job was to get rid of the many pointless little island beds in the back garden. Then I turned my attention to the front.The garden was bisected by a garden path leading up to the door and on each side was a lawn. This was surrounded by knobbly-kneed roses. R. ‘Iceberg’ is quite pretty but these bushes were well past their ‘Best Before’ date. In front of the white picket fence there was a pointless strip of lawn too. What on earth is the use of a little bits and strips of front lawn? They had to go. I dug them up. Under the lawn was a whole network of cherry tree roots which were hideously difficult to get rid of. When I had finished I sat down and thought I might possibly die. The American garden writer, Martha Smith describes the feeling in her book; ‘Beds I have known’. There must be so many gardeners who will identify with what she calls ‘Planter’s Paralysis.’ The awful feeling you get when you realise that ‘you will never, ever rise again’ after you have used muscles that you were not aware you had. Not only did I think that I would never be able to garden again but I thought that I would be welded to my chair for ever or else be condemned to crawling around on my hands and knees to the surprise of Pip, the dog who though it was some exciting, new game. 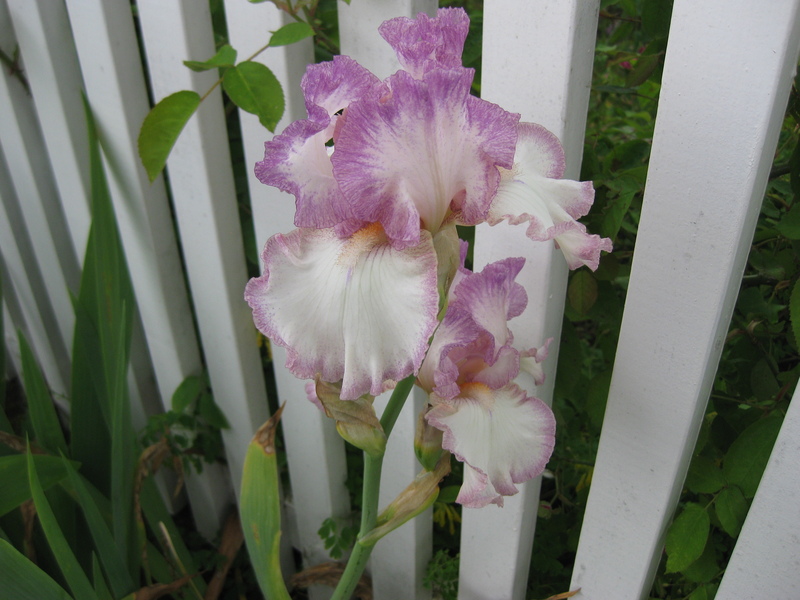 In the place of the strip of lawn in front of the fence I put my collection of irises. Here they can sit and get there rhizomes baked by the sun and don’t have to compete with anything else for light. Unfortunately they have lost their labels as I have dug them up and moved them several times whenever I moved house. 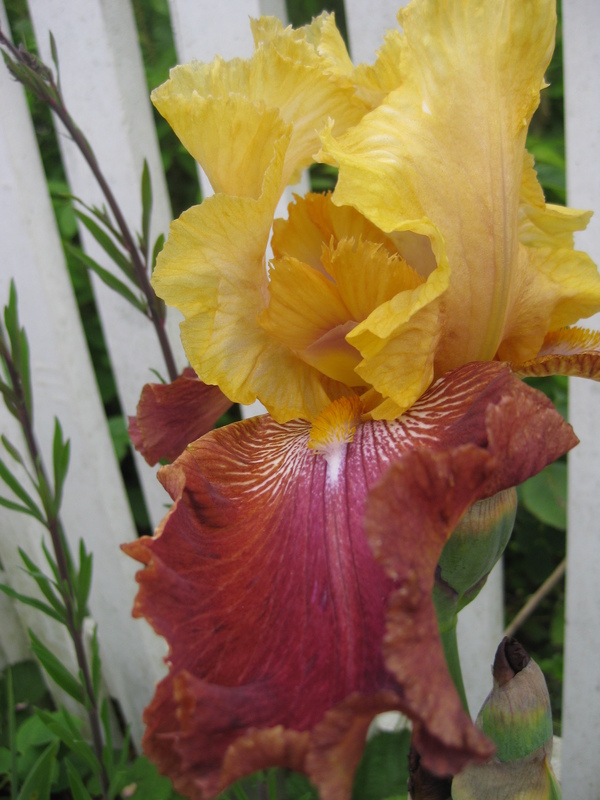 Some of them are Cedric Morris irises. 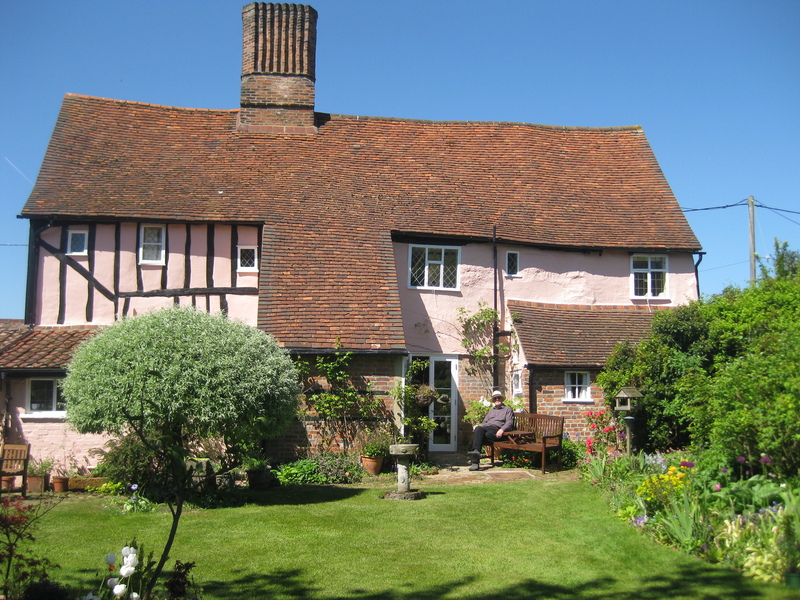 The artist, Sir Cedric Morris lived near here and I have friends who gardened with him. 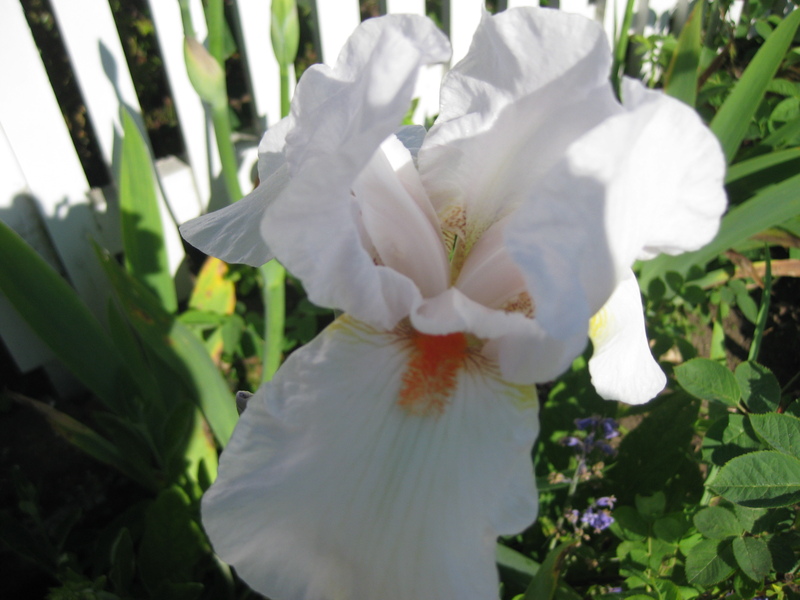 Many gardeners round here grow his beautiful, delicate irises. 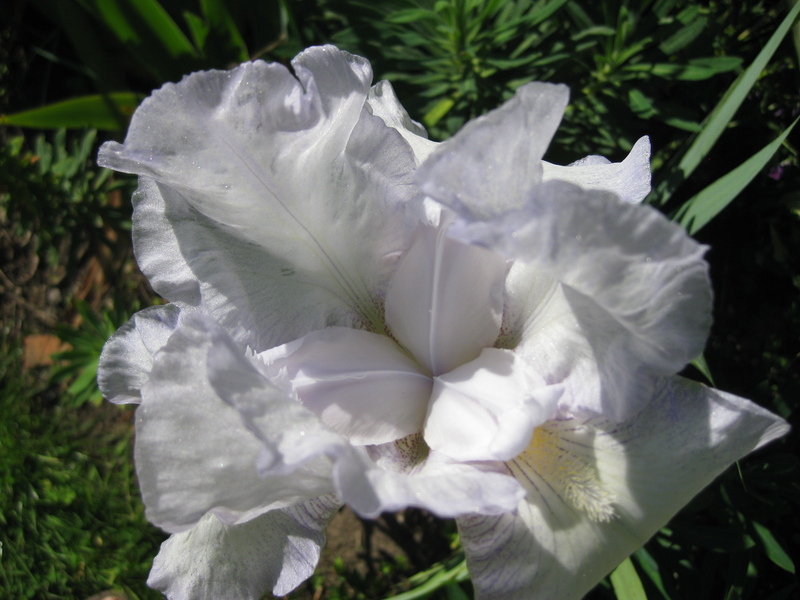 I also have quite a few from the wonderful Cayeux iris nursery in France. 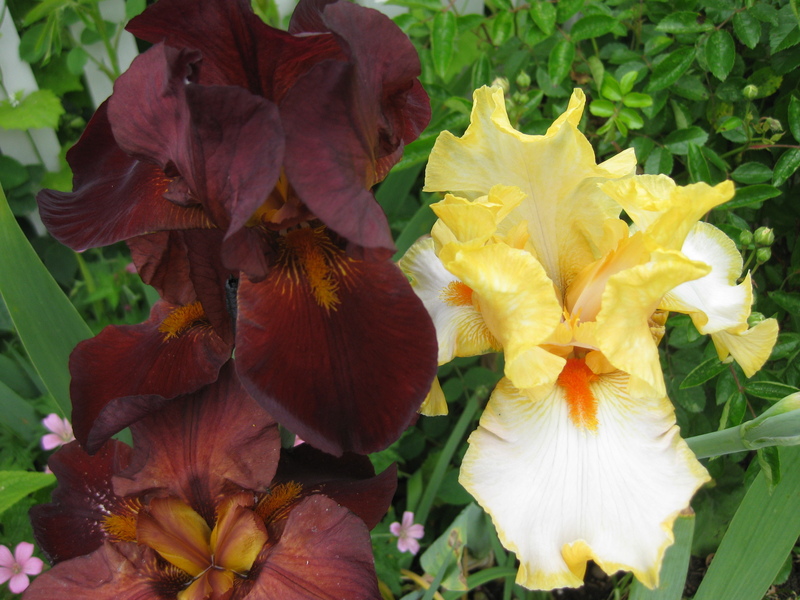 These are big brazen ladies in sumptuous colours. 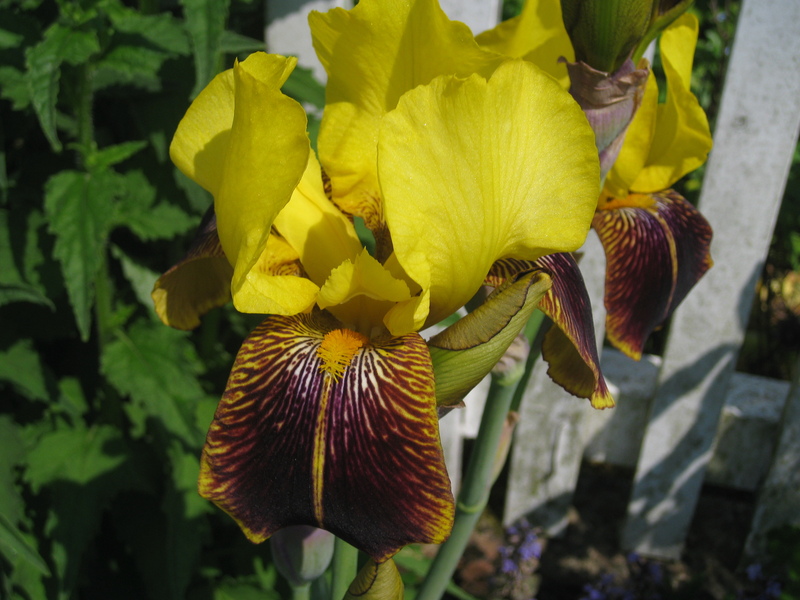 I know they lack the elegance of the Cedric Morris ones but I don’t want all my irises to be tasteful. Their colours are absolutely gorgeous. They don’t last long and they need staking as they are so top-heavy but I wouldn’t be without them. 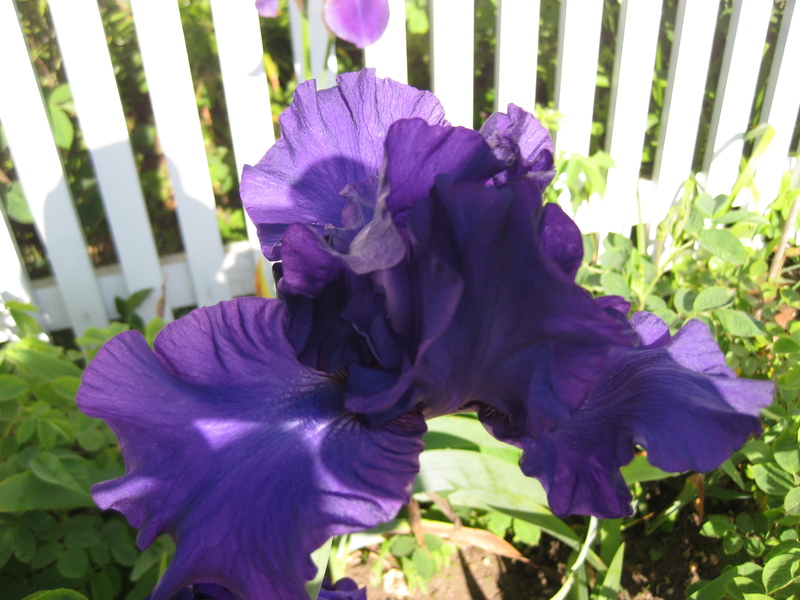 Here are some of my beautiful irises decked out in their glorious party dresses. 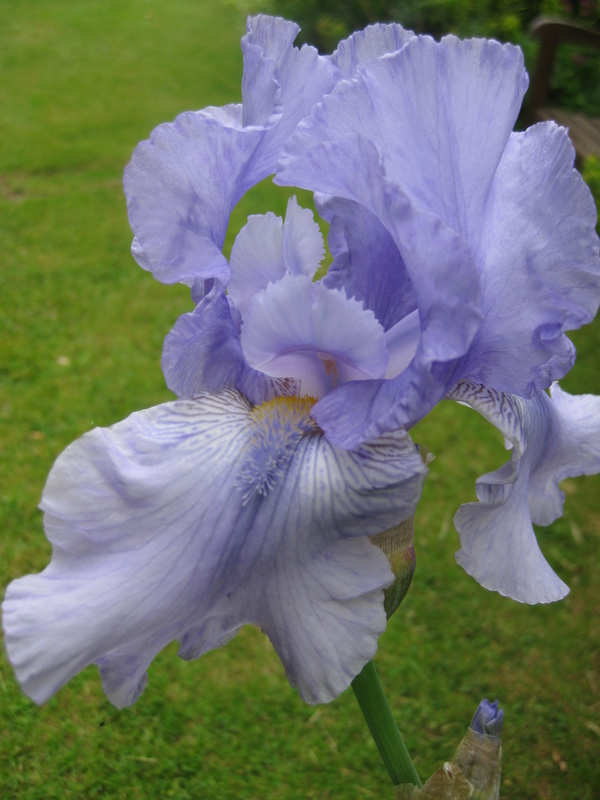 If anyone can help me name my beautiful irises I would be very grateful. What a wonderful history of making (remaking?) your garden. It is beautiful. Thank you, it is a work in progress, there’s still lots to do. Thank you We love it here. Hello Doris, thank you for the comment. I know Woottens very well and have been to their open day when they open their Iris fields to the public. It is an intoxicating sight. Sadly Michael Loftus died in 2012 but the nursery is still going strong and is full of treasures. 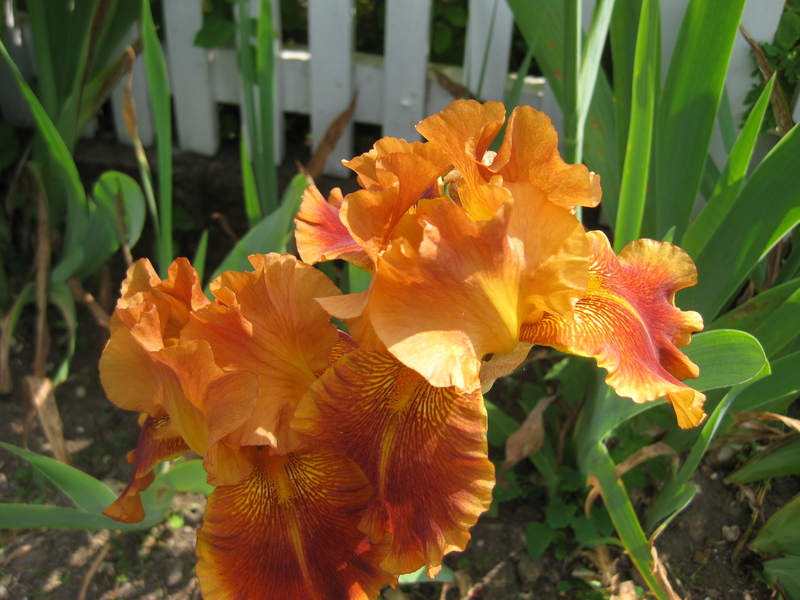 I didn’t find many of my irises there because some of them came from France. The Cedric Morris ones I will sort out this year. Sarah Cooke who lives near me has the National collection of Cedric Morris Irises and she will name them for me and check whether I have any missing from her collection. 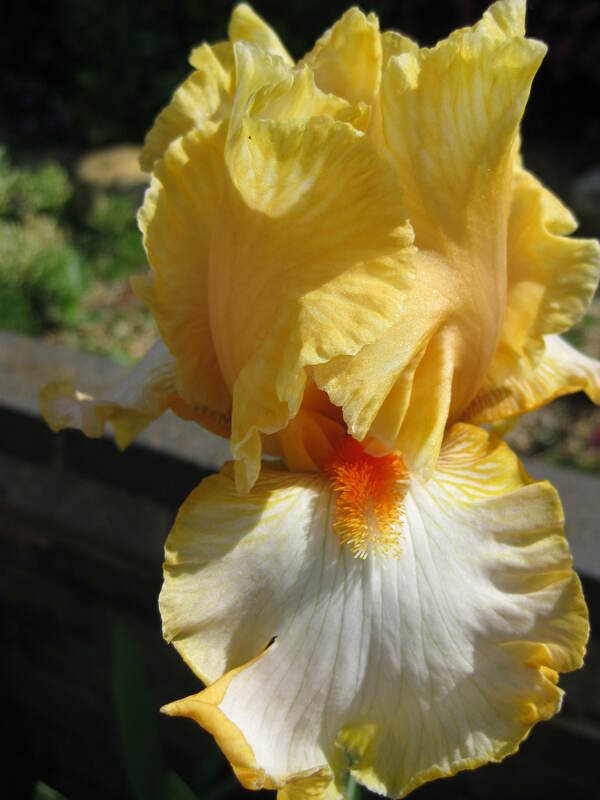 Looking at Iris pictures makes one long for the summer! I so agree with you about island beds in a lawn, you’ve made lots of improvements. 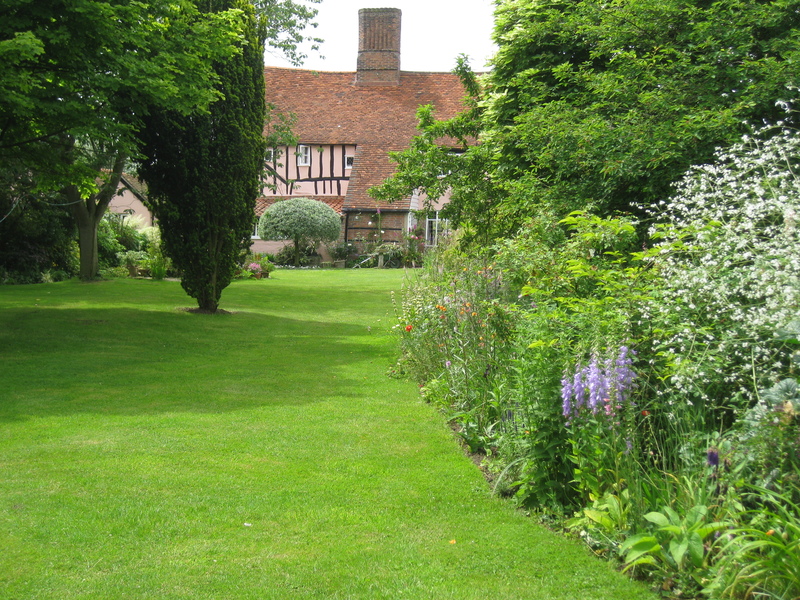 Your house is beautiful; we visit Suffolk very regularly as my MIL lives there, maybe we could meet up at a garden sometime? Yes that would be lovely Christina, Let me know when you are going to be here and come and have lunch with me. I’m glad I’m not the only one to do this. It is always particularly bad the first really warm sunny day of the year; you stay out far too long and your body isn’t used to it. Ouch! Thanks for showing and sharing your garden, Chloris – lucky you’ve got the Pianist to mow the lawn, there’s a lot of it (he does do it well, though! ); I’d much rather be pottering around the borders, like you. 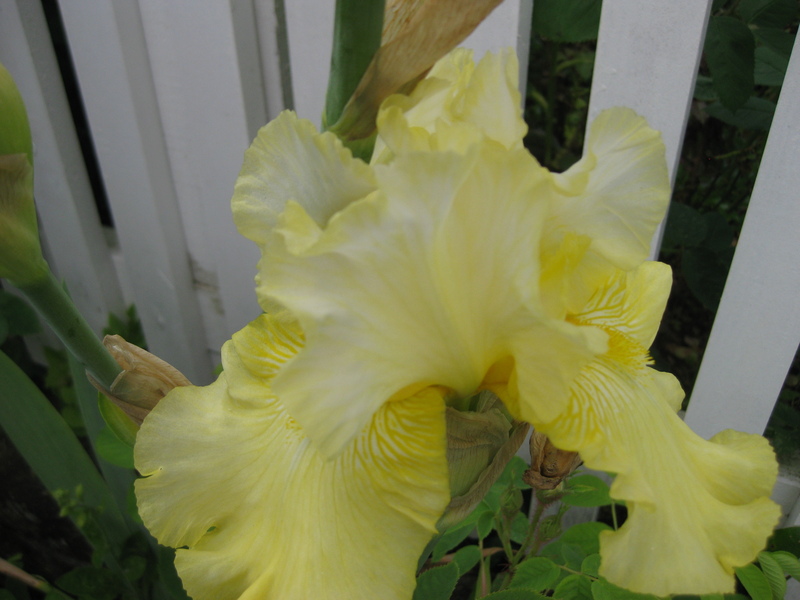 Your description of Planter’s Paralysis made me laugh – I know the feeling all too well! I think every gardener is familiar with Planter’s Paralysis, it’s particularly bad at this time of the year. The first warm days bring us all out and we are all determined to stay out until we can’t move and need to be carried in. Just came across your blog, it’s lovely. Re Hellebores:Elixabeth Strangman was still alive when last I spoke to her! Maybe you could correct it? We have Azara serrata which is not a particularly early bloomer, but is quite showy, what sort of time does yours flower? We are always interested in shrubs that make a good show in Feb/March at tha same time as Snowdrops. Would love ro make a visit with you sometime, then we could go to Southwold and try their F and C, as good as Aldborough? Hello Judy. So sorry to be so late replying, somehow your comment slipped through without me noticing it. Azara serrata flowers in late April/ May much later than Azara microphylla. Elizabeth Strangman died some years ago and she is a sad loss. Her nursery was wonderful. Do come and see me if you come to Suffolk. Chloris, it has taken me two hours to read about your garden! 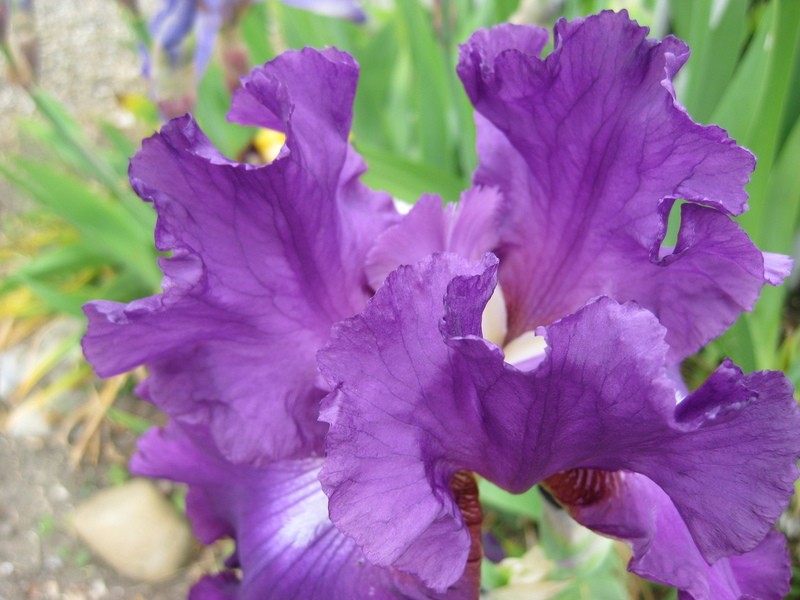 Not just because of all the lovely photos and the story behind it, but because I got sidetracked when you mentioned Cayeaux irises. I just had to check out their webpage for myself, and I wound up placing an order! P.S. 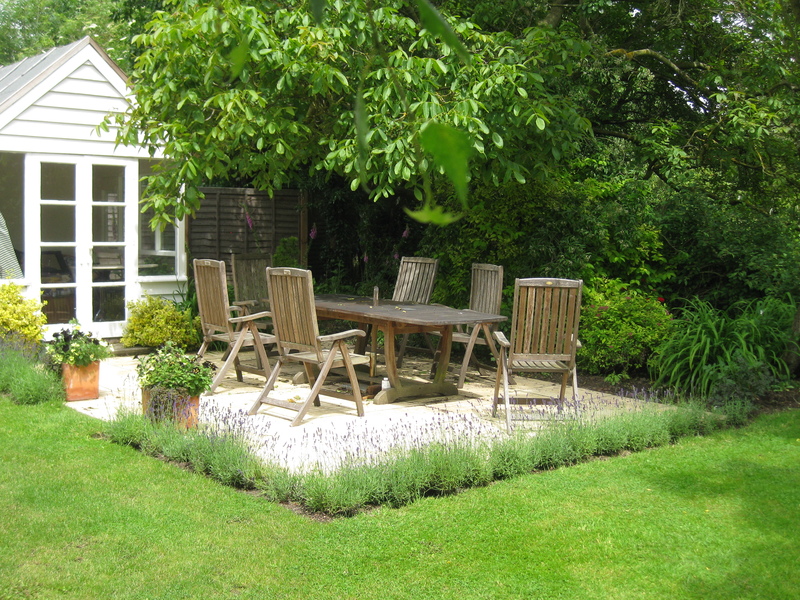 I particularly like the patio area with the lavender. Thank you Karen. 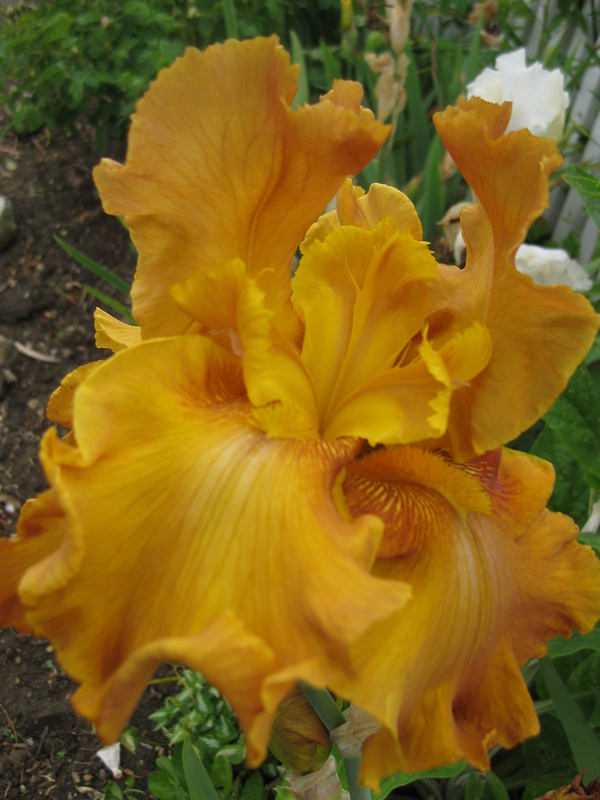 Great that you have ordered some irises, a girl can never have too many irises. Cayeux have some wonderful ones. Absolutely gorgeous. I have just read about your garden for the first time, it is interesting to see how a garden develops from the beginning. 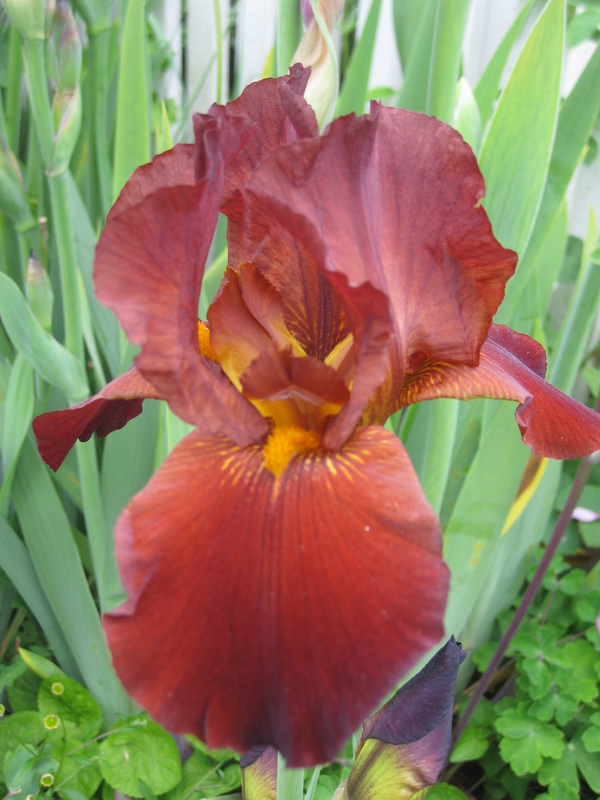 I have several inherited Iris, with sadly no names, it is difficult identifying plants from pictures ect. You are fortunate to have Sarah Cooke living close by. 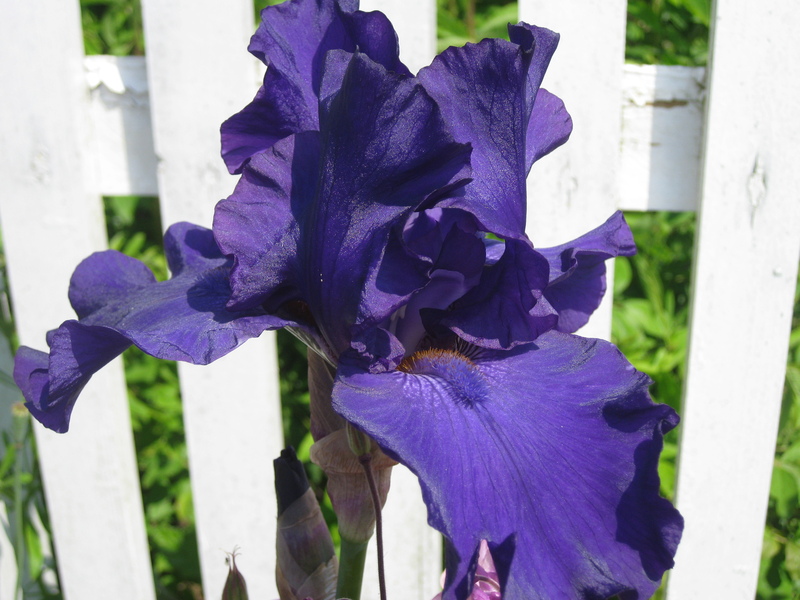 Iris are like peonies beautiful yet fleeting, which is why we love them. 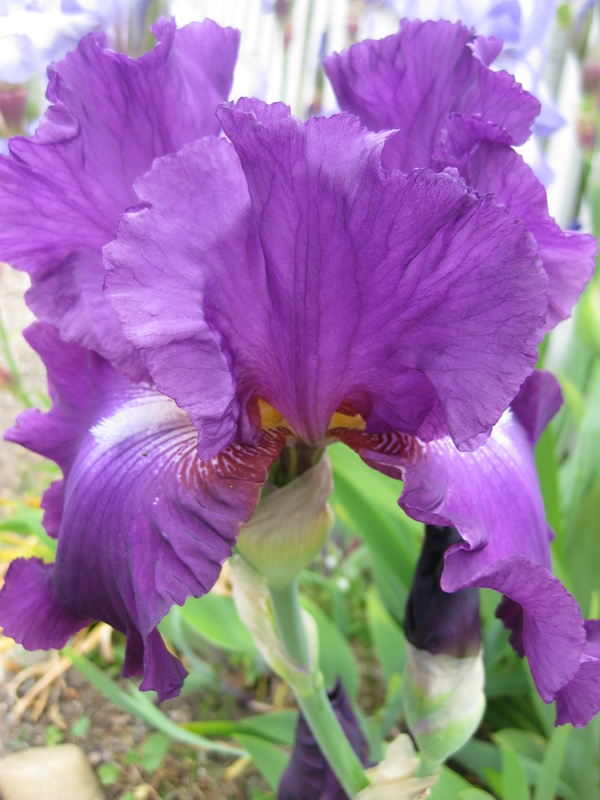 Irises are particularly difficult to identify, there are so many. Yes I agree about the fleeting flowers, we appreciate them all the more because they are so transitory. 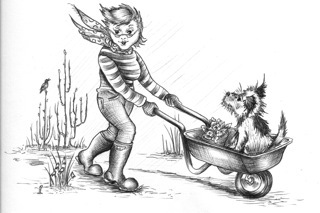 Chloris: I just came over to your blog from Julie at Peonies and Posies, who has nominated me for the Lovely Blog Award! So I must get going on that. But your description here of redoing the beds, and the pointless strips of lawn, and the roots, and the exhaustion… it is wonderful! We all feel those things, as gardeners. It is endless, but then, that’s the point isn’t it? Gardening is a process, not an end (something I have to keep telling myself when it is SO hot and humid and buggy here in the American South.) But oh, the early spring. It is heavenly here as my tulips all come alive. Anyway, I will return and thanks for the wonderful blog here! Hello Chloris, I’ve just found your blog and I’m getting totally absorbed by it. Love your garden, thanks for sharing it with us! Thank you for your nice comment Angela and welcome to my blog. Thank you so much dear Annette, how lovely of you to include me in your top 5 blogs.That has given me just the boost I need as I have rather lost my blogging mojo lately. I have been so busy creating a mediterranean garden that I have been too exhausted to write anything. But now I shall try and catch up a bit. In a Vase on Monday. The Last Trumpets. Six on Saturday. Weird and Wonderful. Bloom or Bust: Alota Allotment!